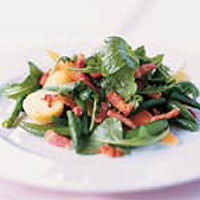 This warm salad of lightly boiled vegetables topped with crispy lardons is substantial enough to make a main meal. Place the potatoes in a pan of cold water, bring to the boil and cook for 6-7 minutes, then add the baby carrots to the pan and cook for a further 5 minutes, or until the potatoes are just tender. Drain thoroughly. Meanwhile, cut the beans in half and add to a separate pan of boiling water with the sugar snap peas. Return to the boil and cook for 2-3 minutes. Drain thoroughly, then plunge the sugar snaps and beans into a bowl of iced water for 3-4 minutes, or until cool - this will help to retain their crispness. In a pan, fry the lardons over a medium heat for 4-5 minutes until crisp and golden. Remove using a slotted spoon and drain on kitchen paper. To make the dressing, lightly whisk the lemon juice and walnut oil together in a small bowl, then season. Place the potatoes and vegetables in a large salad bowl with the rocket. Drizzle with the dressing and toss lightly before topping with lardons. Serve immediately.